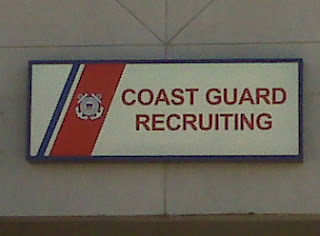 Someone came up with the idea for a Coast Guard recruiting station in Kansas City, Missouri. Someone approved the idea. Someone made the idea a reality. And today, thanks to these unnamed public servants, in a strip mall near the Kansas City International Airport, there is a Coast Guard recruiting center. Makes perfect sense to me. I was raised only a couple hundred miles from water, and I still thought it was, like, the most romantic thing ever. The idea of living away from it makes me a little sick to my stomach now. Most people who live that far away from water do that because they are deathly afraid of it. They boiled their own water away long ago.